Videos: The Comet Shines Again! Videos: by Title: The Comet Shines Again! Having celebrated its 50th birthday in 1998, Crystal Beach's Comet coaster enjoys a new lease on life in New York State's Adirondack region. 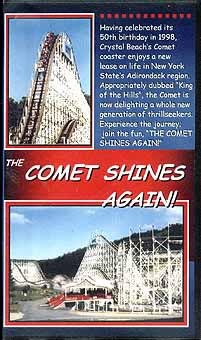 Appropriately dubbed "King of the Hills," the Comet is now delighting a whole new generation of thrillseekers. Experience the journey; join the fun, The Comet Shines Again! From its lonely stand at Crystal Beach to its joyous rebirth in the Adirondack region, witness the continuing legend of the Crystal Beach Comet. Filmmaker Tim Wagner captues the last legacy of Crystal Beach Park, the world famous Comet roller coaster, in The Comet Shines Again! Closed with the Park in 1989, "Canada's Lakeshore Legend" faced an uncertain future. Purchased at the auction, the Comet was given a second chance. Witness the lonely sentinel standing silent at Crystal Beach. Watch the dismantling of this huge structure and its storage on Grand Island. See the massive reconstruction effort underway at Great Escape Fun Park. Rekindle fond memories as the Comet once again takes shape. Rejoice with fellow Comet lovers as the reborn coaster enjoys a grand re-opening in 1994! Experience once again the thrills you thought were gone forever!